Perseverance. Tenacity. Grit. Commitment. Transformation. These are the words that describe what I know of Tony Calderone. Controversial. Opinionated, and, perhaps a few other choice words, also float around the rock-climbing ethers of his stomping grounds in Utah and Idaho. Who is Tony Calderone? 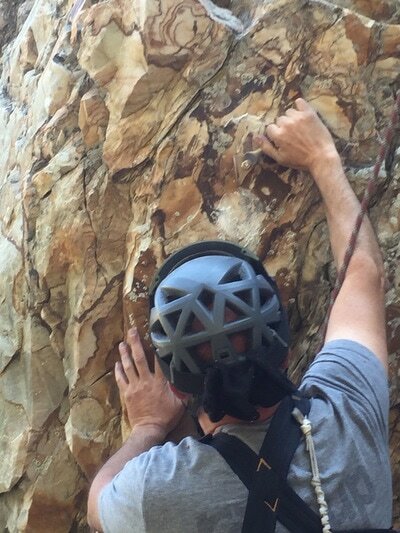 Video was taken while putting up some routes at Big Cottonwood Canyon, UT. Perseverance. Tenacity. Grit. Commitment. Transformation. These are the words that describe what I know of Tony Calderone. Controversial. Opinionated, and, perhaps a few other choice words, also float around the rock-climbing ethers of his stomping grounds in Utah and Idaho. Those later words are remnants of a long rock climbing history in the area, and, perhaps, remnants of youth and personal struggles that spilled over into a public realm. When you are a long-time, free-solo, first ascensionist, and multiple publication guidebook author, you, by default, become a public figure. Add in controversy, unfortunate events, other strong-willed and opinionated folks, and the Internet, and it compounds. But Tony has persevered through his trials and tribulations. I would even say he has overcome. 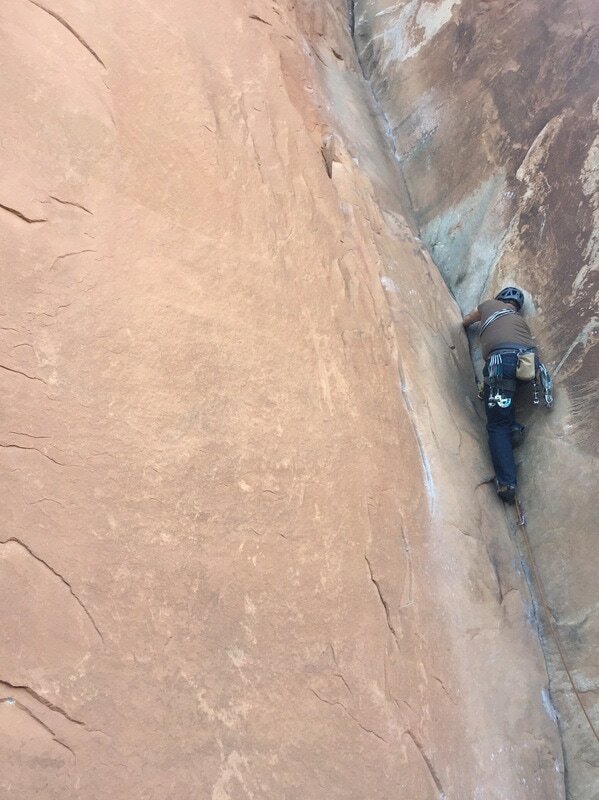 I only met Tony a year ago when my husband, Rick, and I moved to Utah to climb. 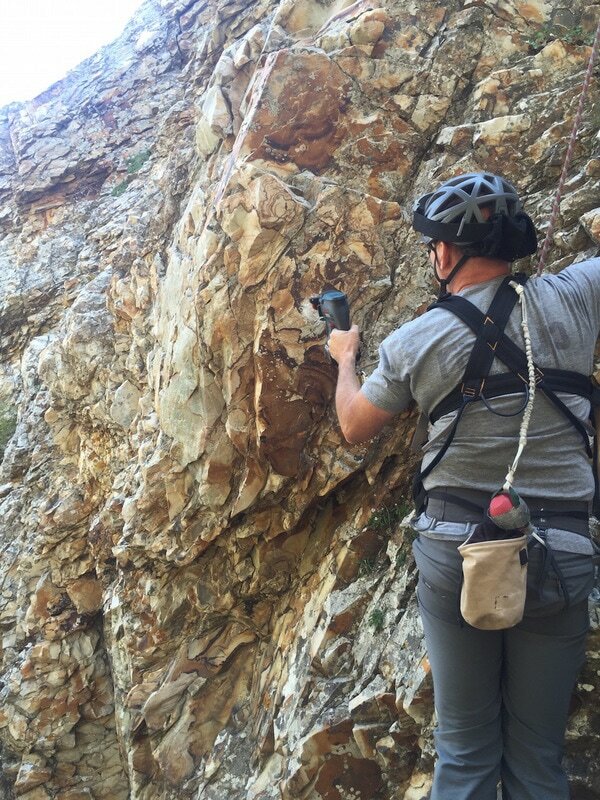 Tony hosted a small rock climbing Meet-up group and, as a result, helped us get oriented in the granite world of Little Cottonwood Canyon and the quartzite world of Big Cottonwood Canyon, both near Salt Lake City. When we first joined Tony’s Meet-up, Rick and I laughed at the long list of “not-allowed” and “must-do” items required to sign up. We couldn’t tell if it was real or a joke. Now, I realize it was both – real with a few joke items thrown in for good measure. But we were cool with it. Ultimately it was all about safety. We had a good time climbing with Tony and getting to know him over some post-climb beers. That was when I began to see how Tony likes to give back. Tony also wrote his masters thesis on “The Fatigue Life of Quarter Inch Bolts in Climbing Applications” where he studied the deterioration of bolts used to protect climbers. From that research he was compelled to replace thousands of unsafe bolts in Little and Big Cottonwoods and City of Rocks. During those climbs and post-climbing beer conversations, it was clear that Tony has a big personality. Having met numerous old-school first ascensionists, I am starting to believe that a big personality is a pre-requisite for that level of rock-climbing accomplishment. Tony certainly shares his opinions enthusiastically. He seems to enjoy the banter of good conversation and differing opinions. But, what I appreciate is that he holds his ground with a smile and a laugh. And, the things I hear him stand up for with the strongest zeal are about rock climbing safety. 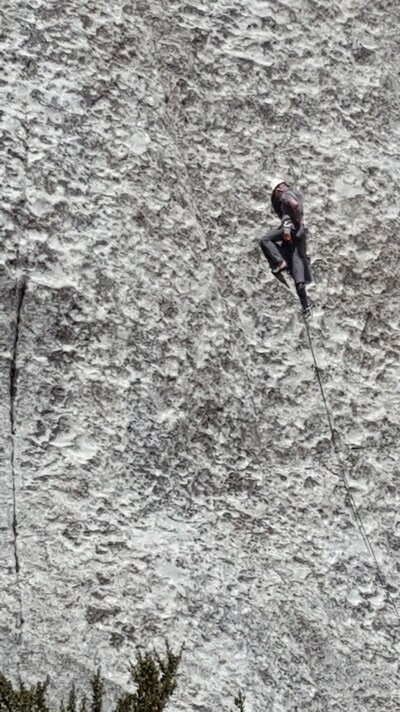 Always have both people tied into the rope, even on single pitch climbs. Use commands that tell the belayer what to do with the rope and can’t be confused on multi-pitch – up rope/slack/on-belay/off-belay. I have always been safety oriented, but what I have learned from Tony, certainly has pushed me to a new level. Although Tony enjoys doling out the opinions, he also listens. This became clear when, after I shared my complaints about critical missing information in guidebooks, he invited me to provide editorial feedback into some of his tomes. The biggest manifestation of my (and other’s) input is in his 2017 Big Cottonwood Canyon guidebook. Tony did this book right. This book not only embodies Tony’s philosophies of guidebook writing, but it also includes key, critical information that is often absent in guidebooks (including some of Tony’s previous publications). NOTE: The development of guidebooks is an evolution in and of itself. The first guidebooks that were released in many areas were simply a documentation of climbs for locals. They did not bother with how to get to a climb (as a local you already knew how to get to that secret spot) nor did they provide details about the climb itself (just go there and climb it). Over the years, as rock climbing’s popularity grew and people began destination climbing, more demands and expectations were placed on guidebook authors – better photos, better directions, more information about the climb. Slowly guidebooks have transformed into what they are today – full color, photo-filled, information-filled books. Thus, many older books lack what we see in current guides. Star ratings based upon 16 or more people’s “average measure of enjoyment” for the route. It rates every climb as G, PG-13, R, or X. Now you clearly know if a climb is well protected. (I love this, because I am not comfortable with run-out). There is no doubt about it. The Big Cottonwood Canyon guidebook is thorough, detailed, and well laid-out. Tony has topped himself on this one. In the beginning of this article I listed words that, in my experience, describe Tony, which includes the powerful word of Transformation. As previously mentioned, from what I can see, as an outside observer, Tony has overcome whatever trials and tribulations existed in his past. During difficult times we have three choices – hide, fight it, or face it. The fact that Tony laughs and smiles as much as he does, that he is still climbing and putting up new routes, that he is still publishing and bettering each subsequent publication, that he still lives and works in Salt Lake City, tells me that he has faced it. I am delighted to dedicate this work to my Lord and Savior Jesus Christ, who saved me from myself. This dedication hints at Tony’s personal transformation and journey. I do not know Tony’s past and do not need to. I do not know Tony’s relationship with himself and God – that is personal and, other than the occasional mention (like in the video above), he does not discuss these things in my presence or the casual presence of others. What I do know is this – it is only fair to be present with someone as he or she is now.